In the early part of September, '91, the eastern overland express on the Denver and Rio Grande was held up and robbed at Texas Creek. The place is little more than a watering-station on that line, but it was an inviting place for hold-ups. Surrounded by the fastnesses of the front range of the Rockies, Peg-Leg Eldridge and his band selected this lonely station as best fitted for the transaction in hand. To the southwest lay the Sangre de Cristo range, in which the band had rendezvoused and planned this robbery. Farther to the southwest arose the snow-capped peaks of the Continental Divide, in whose silent solitude an army might have taken refuge and hidden. It was an inviting country to the robber. These mountains offered retreats that had never known the tread of human footsteps. Emboldened by the thought that pursuit would be almost a matter of impossibility, they laid their plans and executed them without a single hitch. About ten o'clock at night, as the train slowed up as usual to take water, the engineer and fireman were covered by two of the robbers. The other two--there were only four--cut the express car from the train, and the engineer and fireman were ordered to decamp. The robbers ran the engine and express car out nearly two miles, where, by the aid of dynamite, they made short work of a through safe that the messenger could not open. The express company concealed the amount of money lost to the robbers, but smelters, who were aware of certain retorts in transit by this train, were not so silent. These smelter products were in gold retorts of such a size that they could be made away with as easily as though they had reached the mint and been coined. There was scarcely any excitement among the passengers, so quickly was it over. While the robbery was in progress the wires from this station were flashing the news to headquarters. At a division of the railroad one hundred and fifty-six miles distant from the scene of the robbery, lived United States Marshal Bob Banks, whose success in pursuing criminals was not bounded by the State in which he lived. His reputation was in a large measure due to the successful use of bloodhounds. This officer's calling compelled him to be both plainsman and mountaineer. He had the well-deserved reputation of being as unrelenting in the pursuit of criminals as death is in marking its victims. Within half an hour after the robbery was reported at headquarters, an engine had coupled to a caboose at the division where the marshal lived. He was equally hasty. To gather his arms and get his dogs aboard the caboose required but a few moments' time. Everything ready, they pulled out with a clear track to their destination. Heavy traffic in coal had almost ruined the road-bed, but engine and caboose flew over it regardless of its condition. Halfway to their destination the marshal was joined by several officials, both railway and express. From there the train turned westward, up the valley of the Arkansas. Here was a track and an occasion that gave the most daring engineer license to throw the throttle wide open. The climax of this night's run was through the Grand Canon of the Arkansas. Into this gash in the earth's surface plunged the engineer, as though it were an easy stretch of down-grade prairie. As the engine rounded turns, the headlight threw its rays up serried columns of granite half a mile high,--columns that rear their height in grotesque form and Gothic arch, polished by the waters of ages. As the officials agreed, after a full discussion with the marshal of every phase and possibility of capture, the hope of this night's work and the punishment of the robbers rested almost entirely on three dogs lying on the floor, and, as the rocking of the car disturbed them, growling in their dreams. In their helplessness to cope with this outrage, they turned to these dumb animals as a welcome ally. Under the guidance of their master they were an aid whose value he well understood. Their sense of smell was more reliable than the sense of seeing in man. You can believe the dog when you doubt your own eyes. His opinion is unquestionably correct. As the train left the canon it was but a short run to the scene of the depredation. During the night the few people who resided at this station were kept busy getting together saddle-horses for the officer's posse. This was not easily done, as there were few horses at the station, while the horses of near-by ranches were turned loose in the open range for the night. However, upon the arrival of the train, Banks and the express people found mounts awaiting them to carry them to the place of the hold-up. After the robbers had finished their work during the fore part of the night, the train crew went out and brought back to the station the engine and express car. The engine was unhurt, but the express car was badly shattered, and the through safe was ruined by the successive charges of dynamite that were used to force it to yield up its treasure. The local safe was unharmed, the messenger having opened it in order to save it from the fate of its larger and stronger brother. The train proceeded on its way, with the loss of a few hours' time and the treasure of its express. Day was breaking in the east as the posse reached the scene. The marshal lost no time circling about until the trail leaving was taken up. Even the temporary camp of the robbers was found in close proximity to the chosen spot. The experienced eye of this officer soon determined the number of men, though they led several horses. It was a cool, daring act of Peg-Leg and three men. Afterward, when his past history was learned, his leadership in this raid was established. 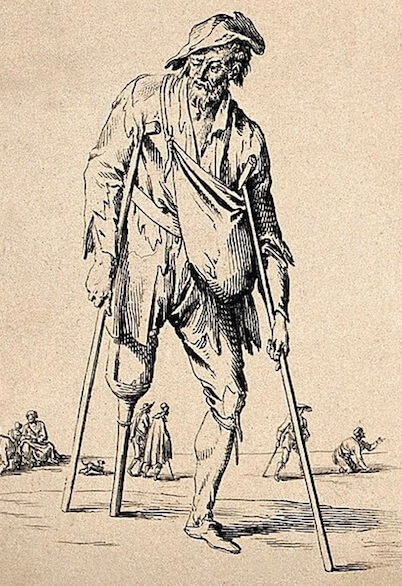 Peg-Leg Eldridge was a product of that unfortunate era succeeding the civil war. During that strife the herds of the southwest were neglected to such an extent that thousands of cattle grew to maturity without ear-mark or brand to identify their owner. A good mount of horses, a rope and a running-iron in the hands of a capable man, were better than capital. The good old days when an active young man could brand annually fifteen calves--all better than yearlings--to every cow he owned, are looked back to to this day, from cattle king to the humblest of the craft, in pleasant reminiscence, though they will come no more. Eldridge was of that time, and when conditions changed, he failed to change with them. This was the reason that, under the changed condition of affairs, he frequently got his brand on some other man's calf. This resulted in his losing a leg from a gunshot at the hands of a man he had thus outraged. Worse, it branded him for all time as a cattle thief, with every man's hand against him. Thus the steps that led up to this September night were easy, natural, and gradual. This child of circumstances, a born plainsman like the Indian, read in plain, forest, and mountain, things which were not visible to other eyes. The stars were his compass by night, the heat waves of the plain warned him of the tempting mirage, while the cloud on the mountain's peak or the wind in the pines which sheltered him alike spoke to him and he understood. The robbers' trail was followed but a few miles, when their course was well established. They were heading into the Sangre de Cristo Mountains. Several hours were lost here by the pursuing party, as they were compelled to await the arrival of a number of pack horses; so when the trail was taken up in earnest they were at least twelve hours behind the robbers. In the ascent of the foot-hills the dogs led the posse, six in number, a merry chase. As they gradually rose to higher altitudes the trail of the robbers was more compact and easy to follow, except for the roughness of the mountain slope. Frequently the trail was but a single narrow path. Old game trails, where the elk and deer, drifting in the advance of winter, crossed the range, had been followed by the robbers. These game trails were certain to lead to the passes in the range. Thus, by the instinct given to the deer and elk against the winter's storm, the humblest of His creatures had blazed for these train robbers an unerring pathway to the mountain's pass. Along these paths the trail was so distinct that the dogs were an unnecessary adjunct to the pursuing party. These hounds, one of which was a veteran in the service, while the other two, being younger, were without that practice which perfects, showed an exuberance of energy and ambition in following the trail. The ancestry of the dogs was Russian. Hounds of this breed never give mouth, thus warning the hunted of their approach. Man-hunting is exciting sport. The possibility, though the trail may look hours old, that any turn of the trail may disclose the fugitives, keeps at the highest tension every nerve of the pursuer. All day long the marshal and posse climbed higher and higher on the rugged mountainside. Night came on as they reached the narrow plateau that formed the crest of the mountain, on which they found several small parks. Here they made the first halt since the start in the morning. The necessity of resting their saddle stock was very apparent to Banks, though he would gladly have pushed on. The only halt he could expect of the robbers was to save their own horses, and he must do the same. Forcing a tired horse an extra hour has left many an amateur rider afoot. He realized this. Knowing the necessity of being well mounted, the robbers had no doubt splendid horses. This was a reasonable supposition. Near midnight the marshal and posse set out once more on the trail. He was compelled to take it afoot now, depending on his favorite dog, which was under leash, the posse following with the mounts. The dogs led them several miles southward on this mountain crest. Here was where the dogs were valuable. The robbers had traveled in some places an entire mile over lava beds, not leaving as much as a trace which the eye could detect. Having the advantage of daylight, the robbers selected a rocky cliff, over which they began the descent of the western slope of this range. The ingenuity displayed by them to throw pursuit from their trail marked Peg-Leg as an artist in his calling. But with the aid of dogs and the dampness of night, their trail was as easily followed as though it had been made in snow. This declivity was rough, and in places every one was compelled to dismount. Progress was extremely slow, and when the rising sun tipped the peaks of the Continental Range, before them lay the beautiful landscape where the Rio Grande in a hundred mountain streams has her fountain-head. With only a few hours' rest for men and animals during the day, night fell upon them before they had reached the mesa at the foot-hills on the western slope. An hour before nightfall they came upon the first camp or halt of the robbers. They had evidently spent but a short time here, there being no indication that they had slept. Criminals are inured to all kinds of hardship. They have been known to go for days without sleep, while smugglers, well mounted, have put a hundred miles of country behind them in a single night. The marshal and party pushed forward during the night, the country being more favorable. When morning came they had covered many a mile, and it was believed they had made time, as the trail seemed fresher. There were several ranches along the main stream in the valley, which the robbers had avoided with well-studied caution, showing that they had passed through in the daytime. There are several lines of railroad running through this valley section. These they crossed at points between stations, where observation would be almost impossible either by day or night. Inquiries at ranches failed on account of the lack of all accurate means of description. The posse was maintaining a due southwest course that was carrying them into the fastnesses of the main range of the western continent. Another full day of almost constant advance, and the trail had entered the undulating hills forming the approach of this second range of mountains. Physical exertion was beginning to tell on the animals, and they were compelled to make frequent halts in the ascent of this range. The fatigue was showing in the two younger dogs. Their feet had been cut in several places in crossing the first range of mountains. During the past nights in the valley, though their master was keeping a sharp lookout, they encountered several places where sand-burrs were plentiful. These burrs in the tender inner part of a dog's foot, if not removed at once, soon lame it. Many times had the poor creatures lain down, licking their paws in anguish. On examination during the previous night, their feet were found to be webbed with this burr. Now, on climbing this second mountain, they began to show the lameness which their master so much feared, until it was almost impossible to make them take any interest in the trail. The old dog, however, seemed nothing the worse for his work. On reaching the first small park near the summit of this range, the pursuers were so exhausted that they lay down and took their first sleep, having been over three days and a half on the trail. The marshal himself slept several hours, but he was the last to go to sleep and the first to awake. Before going to sleep, and on arising, he was particular to bathe the dogs' feet. The nearest approach to a liniment that he possessed was a lubricating tube for guns, which he fortunately had with him. This afforded relief. It was daybreak when the pursuers took up the trail. The plateau on the crest of this range was in places several miles wide, having a luxuriant growth of grass upon it. The course of the robbers continued to the southwest. The pursuers kept this plateau for several miles, and before descending the western slope of the range an abandoned camp was found, where the pursued had evidently made their first bunks. Indications of where horses had been picketed for hours, and where both men and horses had slept were evident. The trail where it left this deserted camp was in no wise encouraging to the marshal, as it looked at least thirty-six hours old. As the pursuers began the descent, they could see below them where the San Juan River meanders to the west until her waters, mingling with others, find their outlet into the Pacific. It was a trial of incessant toil down the mountain slope, wearisome alike to man and beast. Near the foot-hill of this mountain they were rewarded by finding a horse which the robbers had abandoned on account of an accident. He was an extremely fine horse, but so lame in the shoulders, apparently owing to a fall, that it was impossible to move him. The trail of the robbers kept in the foot-hills, finally doubling back an almost due east course. Now and then ranches were visible out on the mesa, but in all instances they were carefully avoided by the pursued. Spending a night in these hills, the posse prepared to make an early start. Here, however, they met their first serious trouble. Both of the younger dogs had feet so badly swollen that it was impossible to make them take any interest in the trail. After doing everything possible for them, their owner sent them to a ranch which was in sight several miles below in the valley. Several hours were lost to the party by this incident, though they were in no wise deterred in following the trail, still having the veteran dog. Late that afternoon they met a pastor who gave them a description of the robbers. "Yesterday morning," said the shepherd, in broken Spanish, "shortly after daybreak, four men rode into my camp and asked for breakfast. I gave them coffee, but as I had no meat in my quarters, they tried to buy a lamb, which I have no right to sell. After drinking the coffee they tendered me money, which I refused. On leaving, one of their number rode into my flock and killed a kid. Taking it with him, he rode away with the others." A good description of the robbers was secured from this simple shepherd,--a full description of men, horses, colors, and condition of pack. The next day nothing of importance developed, and the posse hugged the shelter of the hills skirting the mountain range, crossing into New Mexico. It was late that night when they went into camp on the trail. They had pushed forward with every energy, hoping to lessen the intervening distance between them and the robbers. The following morning on awakening, to the surprise and mortification of everybody, the old dog was unable to stand upon his feet. While this was felt to be a serious drawback, it did not necessarily check the chase. In bringing to bay over thirty criminals, one of whom had paid the penalty of his crime on the gallows, master and dog had heretofore been an invincible team. Old age and physical weakness had now overtaken the dog in an important chase, and the sympathy he deserved was not withheld, nor was he deserted. Tenderly as a mother would lift a sick child, Banks gathered him in his arms and lifted him to one of the posse on his horse. To the members of the posse it was a touching scene: they remembered him but a few months before pursuing a flying criminal, when the latter--seeing that escape was impossible and turning to draw his own weapon upon the officer, whose six-shooter had been emptied at the fugitive, but who with drawn knife was ready to close with him in the death struggle--immediately threw down his weapon and pleaded for his life. Yet this same officer could not keep back the tears that came into his eyes as he lifted this dumb comrade of other victories to a horse. With an earnest oath he brushed the incident away by assuring his posse that unless the earth opened and swallowed up the robbers they could not escape. A few hours after taking up the trail, a ranch was sighted and the dog was left, the instructions of the Good Samaritan being repeated. At this ranch they succeeded in buying two fresh horses, which proved a valuable addition to their mounts. Now it became a hunt of man by man. To an experienced trailer like the marshal there was little difficulty in keeping the trail. That the robbers kept to the outlying country was an advantage. Yet the latter traveled both night and day, while pursuit must of necessity be by day only. With the fresh horses secured, they covered a stretch of country hardly credible. During the day they found a place where the robbers had camped for at least a full day. A trail made by two horses had left this camp, and returned. The marshal had followed it to a rather pretentious Mexican rancho, where there was a small store kept. Here a second description of the two men was secured, though neither one was Peg-Leg. He was so indelibly marked that he was crafty enough to keep out of sight of so public a place as a store. These two had tried unsuccessfully to buy horses at this rancho. The next morning the representative of the express company left the posse to report progress. He was enabled to give such an exact description of the robbers that the company, through their detective system, were not long in locating the leader. The marshal and posse pushed on with the same unremitting energy. The trail was now almost due east. The population of the country was principally Mexican, and even Mexicans the robbers avoided as much as possible. They had, however, bought horses at several ranches, and were always liberal in the use of money, but very exacting in regard to the quality of horseflesh they purchased; the best was none too good for them. They passed north of old Santa Fe town, and entering a station on the line of railway by that name late at night, they were liberal patrons of the gaming tables that the town tolerated. The next morning they had disappeared. At no time did the pursuers come within two days of them. This was owing to the fact that they traveled by night as well as day. At the last-mentioned point messages were exchanged with the express company with little loss of time. Banks had asked that certain points on the railway be watched in the hope of capture while crossing the country, but the effort was barren of results. In following the trail the marshal had recrossed the continuation of the first range of mountains which they had crossed to the west ten days before, or the morning after the robbery, three hundred miles southward. There was nothing difficult in the passage of this range of mountains, and now before them stretched the endless prairie to the eastward. Here Banks seriously felt the loss of his dogs. This was a country that they could be used in to good advantage. It would then be a question of endurance of men and horses. As it was, he could work only by day. Two lines of railway were yet to be crossed if the band held its course. The same tactics were resorted to as formerly, yet this vigilance and precaution availed nothing, as Peg-Leg crossed them carefully between two of the watched places. Owing to his occupation, he knew the country better by night than day. Banks was met by the officials of the express company on one of these lines of railroad. The exhaustive amount of information that they had been able to collect regarding this interesting man with the wooden leg was astonishing. From out of the abundance of the data there were a few items that were of interest to the officer. Several of Eldridge's haunts when not actively engaged in his profession were located. In one of these haunts was a woman, and toward this one he was heading, though it was many a weary mile distant. At the marshal's request the express people had brought bloodhounds with them. The dogs proved worthless, and the second day were abandoned. When the trail crossed the Gulf Railway the robbers were three days ahead. The posse had now been fourteen days on the trail. Banks followed them one day farther, himself alone, leaving his tired companions at a station near the line of the Panhandle of Texas. This extra day's ride was to satisfy himself that the robbers were making for one of their haunts. They kept, as he expected, down between the two Canadians. After following the trail until he was thoroughly satisfied of their destination, the marshal retraced his steps and rejoined his posse. The first train carried him and the posse back to the headquarters of the express company. Two weeks later, at a country store in the Chickasaw Nation, there was a horse race of considerable importance. The country side were gathered to witness it. The owners of the horses had made large wagers on the race. Outsiders wagered money and livestock to a large amount. There were a number of strangers present, which was nothing unusual. As the race was being run and every eye was centred on the outcome, a stranger present put a six-shooter to a very interested spectator's ear, and informed him that he was a prisoner. Another stranger did the same thing to another spectator. They also snapped handcuffs on both of them. One of these spectators had a peg-leg. They were escorted to a waiting rig, and when they alighted from it were on the line of a railroad forty miles distant. One of these strangers was a United States marshal, who for the past month had been very anxious to meet these same gentlemen. "Will you please take this button back and give it, with my compliments, to that human bloodhound, and say to him that I'm sorry that I didn't anticipate meeting him? If I had, it would have saved you this trip with me. He might have got me, but I wouldn't have needed a trial when he did." Add The Passing of Peg-Leg to your own personal library.